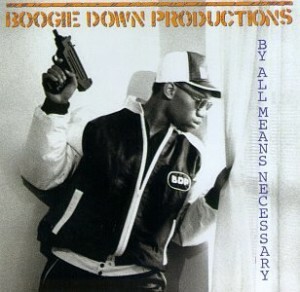 I first heard Boogie Down Productions album “By all Means Necessary” in my first year at college in Leeds. I was sharing an art studio with a cool guy from New York at the time. Frank Schuck had grown up in Queens and was hip to the happening sounds from the big apple in 1989. At this time, rap was just beginning to arrive in the United Kingdom and Boogie Down Productions blew me away. Like many kids of the time, I had grown up on a diet of Indie and New Romantic music throughout the 80’s and I considered that decade to be a musical wasteland. Suddenly, here was this new urban sound that quoted from reggae and had a frontman with a considered and articulate voice. His lyrics were presented in an entirely new format, spoken not sung and they told tales of a land which I had come across, even in the outback of North Wales. There was rebellion and hunger there. After more than 20 years, KRS-1 is “Still Number One”. It was this track, with its inventive use of a pitched down sample, and its relentless name checking followed by killer raps which propelled him to fame, a fame which he has been able to maintain and develop through the continued release of inventive albums. BDP’s tracks came from the streets, literally. KRS-1 came through the New York shelter system, honing his rapping skills in street battles in the Bronx. His rap has a consequent vibrancy and there is a ringing truth in his narratives, which are told with simplicity and authority. The stories he tells are invariably from the street too, but there is a huge gift of intelligence there and KRS-1 turns the stories of gangster rap on their head, using the trappings of gang culture to grab the interest of the youth but, with tunes such as “Stop the Violence” and “T’cha T’cha”, actually preaching a message of self help and counterpointing education as a means out of the ghetto. It is politically and socially conscious rap. KRS-1 stands for Knowledge Reigns Supreme over Everyone.